What's going on? Doidge, Kahle, Karolyi, and Stulz have some intriguing hypotheses. 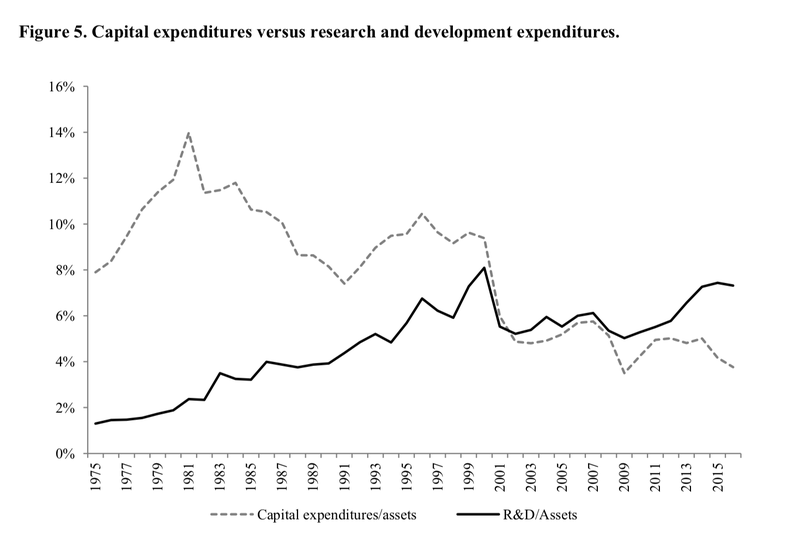 US business is more and more invested in intellectual capital rather than physical capital -- software, organizational improvements, know-how, not blast furnaces. These, they speculate, are less well financed by issuing shares on the open market, and better by private owners and debt. This shift from physical investment to R&D -- investment in intellectual capital -- is an important story for many changes in the US economy. Improvements in financial technology such as derivatives allow companies to offload risks without the "agency costs" of equity, and then keep a narrower group of equity investors and more debt financing. 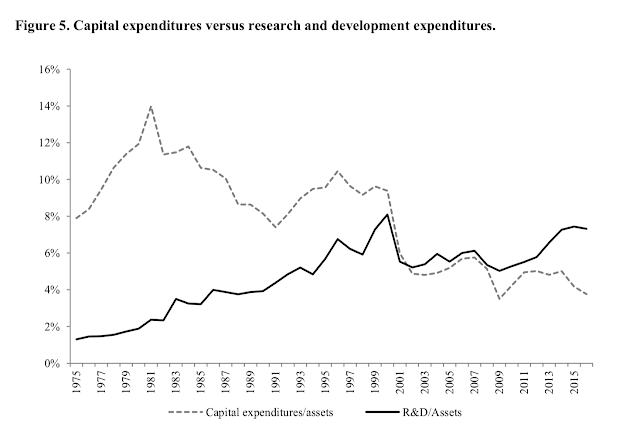 "We argue that the importance of intangible investment has grown but that public markets are not well-suited for young, R&D-intensive companies. Since there is abundant capital available to such firms without going public, they have little incentive to do so until they reach the point in their lifecycle where they focus more on payouts than on raising capital." They leave out the obvious question -- to what extent is this driven by regulation? Sarbanes Oxley, SEC, and other regulations and political interference make being a public company in the US a more and more costly, and dangerous, proposition. This helps to answer the question, why in the US. A wealth tax, easy to assess on publicly traded stock and much harder to assess on private companies with complex share structures -- especially structures designed to avoid the tax -- will only exacerbate the problem. More moves to regulate the boards and activities of public companies will only exacerbate the problem. Warren's proposal to tax 3% of the wealth of the wealthiest Americans is intended to destroy wealth and is likely to succeed. To pay 3% large shareholders like Buffett, Gates, Brin, Page, Zuckerberg will have to sell about 4% of their holdings each year. That will inevitably effect the market prices of the shares in their companies. It is foolish for Warren to say on the one hand that (1) her goal is to destroy large personal holdings of wealth and (2) that the wealth tax will create a sustainable source of revenue. The tax is designed and intended to destroy its own tax base. In India it is the other way round. Interested to know whether institutional context does matter in listing phenomena ! 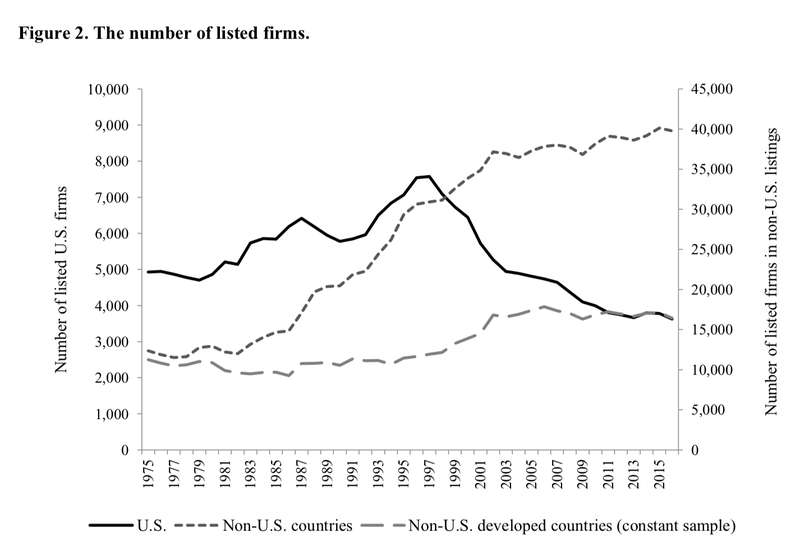 Deregulation of private markets can partially explain the decline. The cost of private equity likely fell in 1996 after the passage of NSMIA. This act created federal preemption of many securities laws historically managed by the states. One of the laws affected was a subset of Rule 506 commonly used by VC and PE investors. See some work on this topic (disclosure: mine....) here: https://papers.ssrn.com/sol3/papers.cfm?abstract_id=3017610 The downsides that you mention are real and something researchers should be studying. FYI, the 500 shareholder rule is now 2000. The JOBs Act in 2012 increased the threshold and allowed firms to ignore many employee shareholders when evaluating the forced registration trigger. "If you worry about inequality, regulations that only rich people may invest in non-traded stocks should look scandalous, however cloaked in consumer protection. " Couldn't agree more. Do you not see that the increase seems to be driven only by the dot-com bubble? No mention of how a private company does not have a similar price discovery mechanism as a traded company and therefore does not have a market based risk proxy of volatility which obfuscates the risk a private company is taking. It appears that the implication is that the market just magically knows how to measure risk of non-traded firms and compare them to traded firms on a risk adjusted basis. But consider that the metrics used to measure the performance of a private company such as IRR, return multiples and vintage year percentiles, also have no concept of risk. Similarly the flavors of PME also have no concept of adjusting for the difference in risk between a non-traded firm and its traded peers. So if these are the tools at the disposal of a private firm analyst, how will he or she asses the firms risk adjusted performance? Without any concept of risk adjustment, a promote fee can be applied at a hard 8% or so whose payoff looks like a call option. The management of the PE firm can apply a bunch of leverage to maximize the expected value of the promote as it would increase equity volatility. In the real estate space in which I am familiar, traded REITs charge around 1% of equity as G&A whereas private value-added funds have averaged around 3% and private opportunistic funds have averaged around 4%. Why would management not prefer to be private if they can charge 4x as much in fees as in traded markets because LPs are willing to pay gigantic fees for beta? That’s not at all what it shows. It shows a decrease after the bubble but there is no evidence that the increase was driven by the bubble. 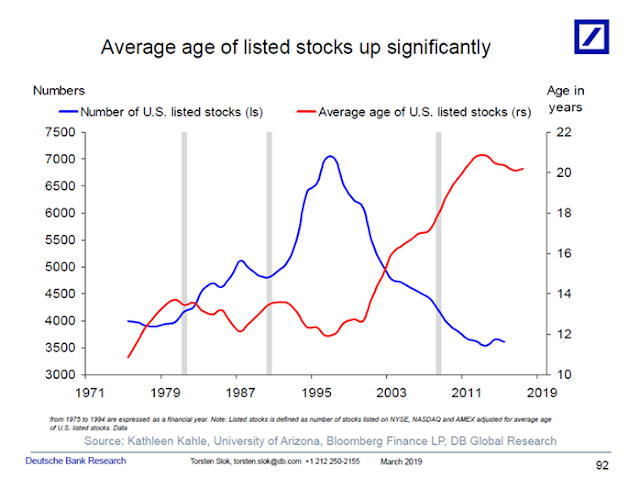 It was an upward trend until the early 2000’s according to that chart. There are publicly listed companies which are known as "business development companies." These companies invest in smaller and medium-size companies with growth stories. I have not heard a publicly listed company that invests in high-risk venture-capital situations as a primary business. That would suggest there is very little public appetite for such a company. I would prefer less regulations rather than more. But I wonder if we can fight inequality by opening up venture-capital markets to the masses. Increasing the standard deduction on income taxes is probably a good way to help ordinary workers. Once upon a time, in a previous millennium, I worked as a lawyer on SEC issues for some public corporations. I know that the complication of those rules, and the cost and difficulty of compliance have metastasized since then. I would cite the reduced number of public corporations as evidence of that. Exactly, Fat Man. Not only public companies, the SEC regs were so draconian for hedge funds and Broker-Dealers, our compliance department became bloated with former SEC attorneys so as to insure we turned square corners. Some of them were compensated as well or better than our traders. When Dodd-Frank entered the arena, we closed down rather than figure out what the law required of us. Compliance costs, always going up with regs changing too often. And now, fear of wealth taxes. Yet the current tax regime is not fair. A "fair regime" would have the growth of income of the top 1% (or 10%?) be no more than the growth of the median income. Both 2%, 5%, 10%. There is little to no growth at median, but huge growth at top 1% -- unfair tax regime. Wealth tax proposals will be increasingly popular. Taking companies private will increasingly be a way to hide some of the wealth. The article contains some astute observations on the effect that legislation can have on the real economy through regulation. To avoid regulation, such as Sarbannes-Oxley, etc., firms stay off the public stock exchanges. Publicly-listed firms grow in size in order to counter-act the "game against Nature" disadvantages that small size is known to have, where "Nature" in this context is the regulatory-state (S.E.C., Federal Reserve, etc.). That this is seen in the U.S.A. primarily strongly suggests that the observed changes in listings and size of listed firms is a response to propensity in the U.S.A. of the federal government and Congress towards increased intervention in the name of protecting the investing public. Allusion to Sen. Warren's proposed 2% and 3% tax on "wealth" of households is appropriate in this context. It would be useful to have Dr. Cochrane's thoughts on the path the American economy would take following a successful legislative effort to impose such a tax, assuming that the constitutional issues were to be overcome.